I can't adjust my brake tension! If you have no brake tension at all, the brake band is not in place around the bobbin. If you have too much brake tension, the adjustment mechanism is stuck or damaged. This can happen with a new spinner who is not familiar with the controls, or if a child plays with the adjustments. If the brake adjustment is tightened excessively, it is possible to pull the swivel down into the hole in the base, where it gets stuck. If this happens, you will not be able to loosen the brake. See the photo below. 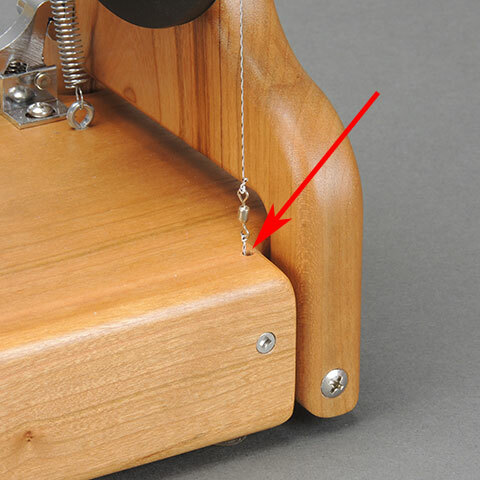 If this happens, you can usually fix it by turning the wooden brake adjusting knob counterclockwise a turn to loosen the internal adjusting cord, then simply pull the swivel out of the base. If it is really stuck, you may need to use pliers. Once the swivel is free, turn the brake adjusting knob counterclockwise until the brake is properly adjusted; the spring at the left rear of your miniSpinner should be stretched little, or not at all when properly adjusted. If someone has tightened the brake adjustment beyond the point where the swivel is stuck in the base, it is possible to damage or break the internal brake adjusting assembly. If this happens, it will need to be replaced. How to replace the internal brake assembly.